There’s no doubt about it: Wolff’s is the place to go for tomato and pepper plants in the Delaware Valley. With a current selection of 116 varieties of tomato plants (and counting) and 64 varieties of peppers to date, it would be pretty hard to not be able to find what you are looking for! The list includes many well-known backyard garden varieties, such as Beefsteak, Better Boy, Brandywine, Fourth of July, Rutgers, Sun Gold, and Tomatillo. And there’s plenty of varieties you may have never heard of with fantastic names such as Mortgage Lifter, Orange Russian, Mama Leone, Eva’s Purple Ball, Snow White, Poseidon, Pineapple, Mule Team, Mr. Stripy, Black from Tula and the list goes on and on! Many of the pepper varieties are more familiar, like Bell, Sweet Banana, Cayenne, Habanero, Jalapeno, Serrano, Tabasco. Within the next few weeks, Wolff’s garden center will abound with over 160 varieties of conventional, heirloom and grafted tomato varieties and over 80 varieties of unique pepper plants. As people began to cultivate and breed tomatoes commercially in the 1860’s, hundreds of new varieties of tomatoes were born. According to a publication on tomatoes by Penn State College of Agricultural Sciences, “heirloom tomato varieties have become popular in many local fresh markets. They are old varieties that have been passed down from generation to generation. They are generally not well suited to large-scale production for various reasons, including difficulty in shipping, lack of fruit firmness, uneven ripening, disease susceptibility, and indeterminate growth habit.” But when grown on a smaller scale and consumed quickly, heirloom varieties can be a delicious addition to any garden. So why do we sell so many varieties of tomatoes (and vegetables, fruits and herbs for that matter)? Brandywine, a classic tomato variety has vines that can grow to be 10 feet tall with plump tomatoes. It is very disease tolerant. For a smaller vined tomato plant with more deeply colored red fruit, try Red Brandywine. 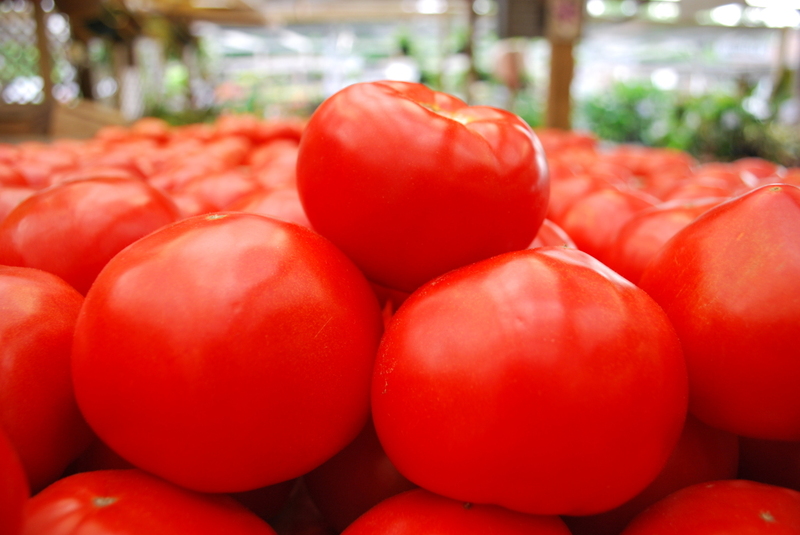 At Wolff’s, you’ll find pink, red and black varieties of Brandywine tomatoes. Cherokee Purple is as the name suggests, a purple tomato. It produces a large yield early in the year, has a wine-like sweet flavor and is also known to be very disease-resistant. Ananas Noire is another purple tomato that is known for delicious flavor and good productivity. Better Boy is a very productive hybrid, bringing forth large, uniform, flavorful fruit. This extremely disease tolerant variety produces fruit until the first frost. Aunt Ruby’s German Green has a classic, rich tomato flavor. It typically stays green until it’s ready to harvest (unlike many green tomato varieties that turn yellow before ripening). Striped German is a bicolor with mild and sweet yellow flesh and stripes of red. These unusually colored tomatoes stand out from the rest and make a beautiful contribution to any salad or salsa. Brandy Boy is a variety we’re super excited about. It’s a cross between Brandywine, a cult classic among heirloom enthusiasts, and Better Boy, one of the most prolific and popular tomato varieties ever. So with another beautiful weekend ahead of us, why not stop in at Wolff’s and pick up some tomato plants? As long as you are visiting during plant season, our friendly plant and garden staff is usually around to give you lots of helpful tips to help your vegetable plants bloom.